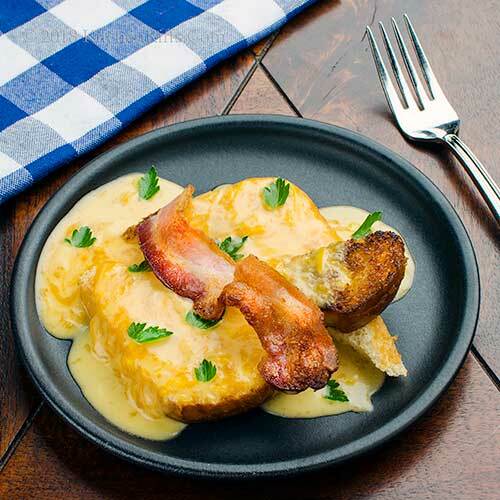 Welsh Rarebit – a/k/a Welsh Rabbit – is comfort food with savor. It’s quick and easy to make too, so it’s perfect for a weeknight dinner. Or maybe a midnight snack. Fast and flavorful, this dish will put a twitch in any bunny’s nose. Welsh Rarebit traditionally uses beer or ale as an ingredient, and we prefer it that way. But some recipes substitute milk or cream, which is ideal for those who prefer not to use alcohol in cooking – see Notes for that version. We like to garnish this dish with fried bacon. It looks nice and adds extra heft. Want even more gravitas? A Fried Egg garnish would be wonderful. As would a Poached Egg. BTW, when Welsh Rarebit is served with an egg on top, it’s sometimes called Buck Rabbit or Golden Buck. This dish takes no more than 15 minutes to prepare. The recipe makes about 4 servings. Leftover cheese sauce keeps for a few days if refrigerated in an airtight container. The sauce for Welsh Rarebit takes just a few minutes to make, and you’ll want to serve it immediately. So you need to have the toast and bacon garnish (if using) ready to go. For making toast, you can just use the trusty toaster. Or layer the bread on a baking sheet and slide it under the broiler in your oven until lightly browned (you can butter the bread if you want; that adds extra goodness, and we recommend it). For preparing the bacon: Pan fry it if you wish, or microwave it. Now whisk the mustard into the roux. Add the beer and Worcestershire sauce, then cook for 2 minutes. Remove the pan from the heat. Stir in the cheese, and continue stirring until it’s melted. Taste the sauce and add hot sauce (if using) to taste. Add salt if needed. To serve, cut the toast slices in half and arrange them attractively on individual serving plates. Cover the toast with sauce, then add some chopped parsley for garnish if you wish. Top with a slice of bacon, if using. Serve and enjoy. What kind of beer to use? Whatever you have on hand! Many cooks use a darker beer like porter or stout, but we find the flavor too heavy. We generally use an ale. We don’t suggest using an IPA, though – the flavor is too hoppy in this recipe, at least for us. How much beer to use? We find that ¾ cup of beer makes for a fairly thick sauce, which we like. If you want a thinner sauce, use 1 cup of beer. If you don’t want to use beer, just substitute milk. Or cream if you’re going for a particularly rich dish. We’ve also seen recipes that substitute tomato juice for beer. In which case the dish often is called a Blushing Bunny. You can probably substitute all sorts of liquids for beer. Some cooks use cider. White wine would take the sauce in a different (but tasty) direction. And who knows what red wine would do? Play with your food – it’s fun. Cheddar cheese is traditional in this dish. But you can substitute any cheese that will melt. The more mustard and Worcestershire sauce you use, the more strongly flavored the dish will be. We suggest starting with less. You can always add more to taste. BTW, you can substitute dried mustard powder if you like. We suggest using ½ to 1 teaspoon. Some recipes call for using an egg yolk or two in the sauce. 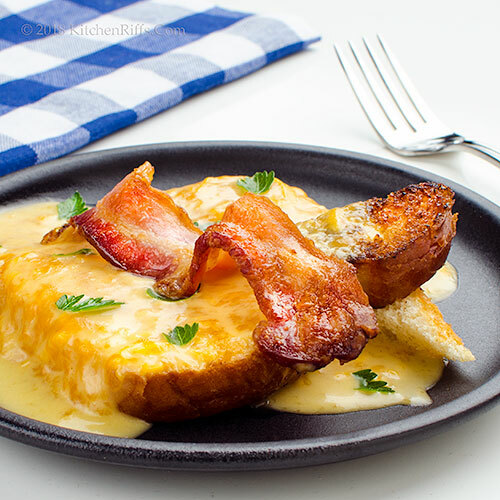 We’ve never made Welsh Rarebit that way, but it may be worth a try. These recipes often skip the flour, since the egg yolks will thicken the dish. Toast is the traditional base for this dish, but you could substitute biscuits, English muffins, whatever. Toasting bread under the broiler is the easiest way to produce a whole batch of toast in a short period of time. If you’re using this method, you may want to butter one side of each piece for extra lusciousness. BTW, we think white or light wheat bread makes the best toast for this dish. But whole wheat works, too. If your serving plates are heatproof, you can run the plated dishes under the broiler for a minute or so to brown the top of the cheese. Or even use a kitchen torch. Rarebit or rabbit? Danged if we know! This dish dates back to 18th century Britain, and probably was called rabbit originally. But over the years, the name has been changed to rarebit. Maybe because there’s no rabbit in the dish? Or because folks thought it sounded more refined? Beats us. Call it whatever makes you happy. “So you don’t think this is a hare-brained dish?” I said. “I’d say it’s the big cheese of sandwiches,” said Mrs K R.
“I’m happy as Peter Rabbit in a carrot patch,” I said. “If he catches me, I’ll be toast,” I said. True. Hare today, gone tomorrow. Easy, fuss free, and so wonderfully delicious! Can't take my eyes off from the melted cheese. Hi Angie, isn't this a great recipe? LOADED with flavor, and so quick and easy to make. :-) Thanks for the comment. Beer, cheese, bacon? What's not to love? And no, bacon is never optional at our house. It's required! Great, simple recipe. Hi Terry, bacon is never optional here, either. Love the stuff! And this is a neat recipe -- really easy and truly tasty. :-) Thanks for the comment. Yes please!!! This one has me drooling. Hi Pam, it's definitely drool-worthy. :-) Thanks for the comment. I love that you make so many classic dishes and cocktails. 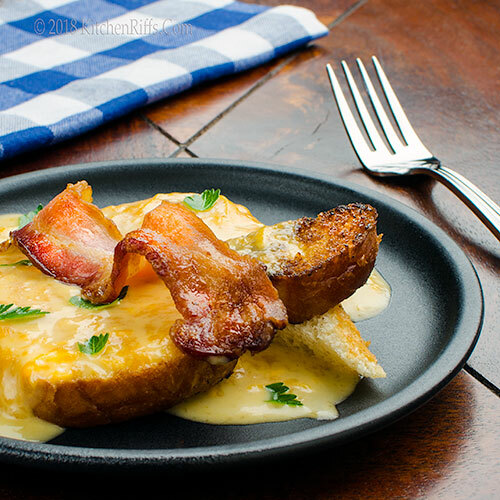 I have heard so much about rarebit and can't wait to try it! Hi Laura, maybe we make so many old classics because we're old classics? :D This is really good -- you'll love it! Thanks for the comment. I need this NOW! And bacon is so much better than a tomato on the top! 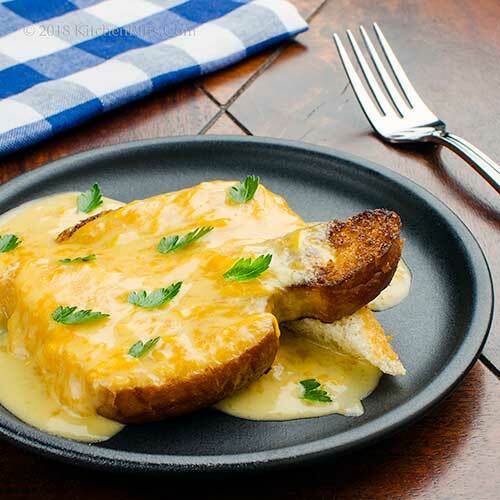 In any case this cheesey sauce with toast is pure comfort food to me! Hi Abbe, we really like molten cheese on toast, too. Topped by bacon, of course. :-) Thanks for the comment. It's the most confusing name, I always think there should be rabbit in it lol. But even without ;-) it really does look delicious and love the added fried bacon. Hi Evelyne, it does seem as if it should have rabbit, doesn't it? The history of the name of this dish is definitely confusing. But its flavor isn't -- really good stuff! :-) Thanks for the comment. I think I have some bacon in the freezer. Maybe I make it with prosciutto. You are making me hungry John. Hi Gerlinde, prosciutto is an outstanding idea! :-) Thanks for the comment. What a wonderfully rich and decadent dish, perfect for the chilly days we are still having. Love that it's a cheese sauce as opposed to just grated cheese, the beer and added flavourings must make this dish taste out of this world. I'm drawn to the egg and bacon version. A dinner everyone will enjoy! or the best brunch ever! Hi Eva, the beer adds such a terrific flavor! And of course the cook gets to drink the rest of the bottle. :-) Thanks for the comment. Hi Deb, garnishing with both egg and bacon is total comfort food! Thanks for the comment. Wow this looks amazing. You said it was good for dinner or a midnight snack but would I be breaking all the rules if I had this for breakfast!? I could start my day with this!! Hi Dahn, sure have this for breakfast! It'd taste wonderful. :-) Thanks for the comment. I'm swooning over all that cheese! This sounds delicious! Hi Kelsie, it IS delicious! :-) Thanks for the comment. Hi Merryn, this is really good! And you'll have fun playing with the amount of mustard, hot sauce, etc. :-) Thanks for the comment. OMG! John, we are feeling weak in the knees looking at your delicious photos. This is some serious comfort food. Bacon, cheese, beer. Boys are going to love this one. Hi Tricia, easy and really tasty -- winner! :-) Thanks for the comment. Hi Bobbi, this does have your boys' name on it. :-) Thanks for the comment. This looks sooooo delicious and doable. I know my teens are going to love these!! Bookmarked! Hi Minnie, good to see you again! And your teens will devour this. :-) Thanks for the comment. Have never had Welsh Rabbit before. In fact I didn't know much about it. Beer? That sounds good already. Beer and cheese? Sounds like one of my favorite soups - beer cheese soup. But of course, it's the bacon that sells it. :) I need to finally give this a try. Thanks John! Hi MJ, once you try this, you'll kick yourself that you didn't try it sooner. And beer, cheese, and bacon is a wonderful combo. :-) Thanks for the comment. What an interesting name for an open-faced sandwich. It looks yummy! Oh yum. I haven’t had this since my mum used to make it when we were kids I’ve tried to make it myself but it never works. I must try this one. Cheers sherry. I’ve never made this! What’s not to love about it. Comfort food at its best. YUM!!! This is definitely not hare-brained! It's a perfect sandwich with a great use of cheese! Haven't made it in ages, but that will change soon after seeing this, John. Love your version! Hi Denise, the name is kind of a mystery, isn't it? :-) Thanks for the comment. Hi Sherry, this is such a neat dish! We tried a lot of version to get the flavor profile that we liked. You may have to play a bit with ingredients and quantities to get it exactly the way you like. Thanks for the comment. Hi Vicki, you'll love this! Just a knife-and-fork toasted cheese sandwich. :-) Thanks for the comment. Hi Pam, such a fun dish, isn't it? And SO good! Thanks for the comment. This is such a great recipe, one of my lunch favourites! Hi Carolyn, so easy and so good -- terrific dish! Thanks for the comment. 15 minutes? Now you're speaking my language! Love that bacon on top! Wait, where's the actual RABIT?!?!?! OH WAIT, it's RAREBIT! LOL!!!!!! Hi Ashley, bacon is always good, isn't it? :-) Thanks for the comment. Hi GiGi, it'd be interesting to make an actual rabbit version of this, wouldn't it? :-) Thanks for the comment. My husband would definitely approve! Bacon, beer, cheese---what's not to love??? Hi Liz, bet you'd like this too. :-) Thanks for the comment. Hi Greg, definitely hop to it. :-) You'll really like this, I think. Thanks for the comment. Hi Frank, beer and cheese is such a great combo, isn't it? And this is a great dish! Thanks for the comment. Oh, so that's Welsh rarebit! I've heard of it, but never have had it. It sounds easy enough - and delicious! Hi Jeff, you'd love this! And I baked the bacon for the dish -- your favorite way of preparing it, I know. :-) Thanks for the comment. This looks right up in my alley! Will try to make it this week. Thanks for sharing. I was so confused the first time I saw the word - rarebit! Was it a mispelling??!!! An odd name, but so is Cullen Skink and Bubble and Squeak! This is wonderful and so appealing. Hi Raymund, that'd be a terrific breakfast! :-) Thanks for the comment. Hi Carolyn, I'll have to work on the chocolate! :-) Thanks for the comment. Hi Peachy, you'll love this! Thanks for the comment. Hi Mimi, rarebit is definitely an odd word. But such a good dish! Thanks for the comment . I'd be happy as Peter Rabbit in a carrot patch, too -- this looks soooo good! I haven't made this in a gazillion, but I'll try this version soon. I'll probably use Newcastle Brown Ale for it. Wonder how it'd be with my homemade sourdough bread? Pinning. Hi Jean, this would be fantastic with your homemade sourdough bread. :-) Thanks for the comment. Easy, peasy, this is great any time of the day. Thanks John. Hi Amira, we love easy, tasty dishes. :-) Thanks for the comment. One of the classics that I've never tried...sounds good topped with bacon. By the way, your answer to Laura about "old classics" gave me a real chuckle. Hi Karen, :-) Bacon makes everything better. And this is a terrific -- and easy! -- dish. Bet you'll like it. Thanks for the comment. Can you believe this is something I've actually never had?! It's looks amazing, especially with that crispy bacon on top! Hi Amy, bacon gets all of us every time, doesn't it? :-) Thanks for the comment. I've heard about this dish forever and I've never made it, John. Now that I've seen it, I have to have it! It looks amazing, thanks for sharing the recipe! Hi Marcelle, isn't this a nice looking dish? And its flavor is even better! Thanks for the comment. Hi Emma, this is a wonderful weeknight dish -- so quick and easy, and so full of flavor. :-) Thanks for the comment. Oh, this is my kind of comfort food! So perfectly delicious and flavorful. Love your photos, John! Hi Robyn, this is a wonderful dish! So full of flavor, and very soothing. :-) Thanks for the comment.